Tasteful yet minimal design are at the centerpiece of this recently constructed, 18.5 foot-wide Upper East Side townhouse for sale. There are two entrances to this limestone matched with red brick and rose wrought-iron fence mansion. The first is to a basement that includes a maids room, a laundry room and a wine cellar. The main entrance features a beautiful mahogany door that opens to a grand foyer with 11’ foot ceilings, a half-bath, a coat closet and an elevator – which services every floor. Past the foyer is a custom designed Clive Christian chefs kitchen that features an informal dining space, a dishwasher, two sinks and an eight-burner Wolf stove that has an oven and a broiler beneath a high powered vent. The kitchen adjoins a den with bay windows decorated with flowers, and French doors that open to an enclosed landscaped garden surrounded by ivy, wiring for lights, audio and brick pavers. Take the spiral ironwork staircase up one flight to the parlor. To the left is an inviting and elegant living area with high ceilings, a fireplace, and floor-to-ceiling French doors that flood the room with natural light and opens to a balcony overlooking the garden. 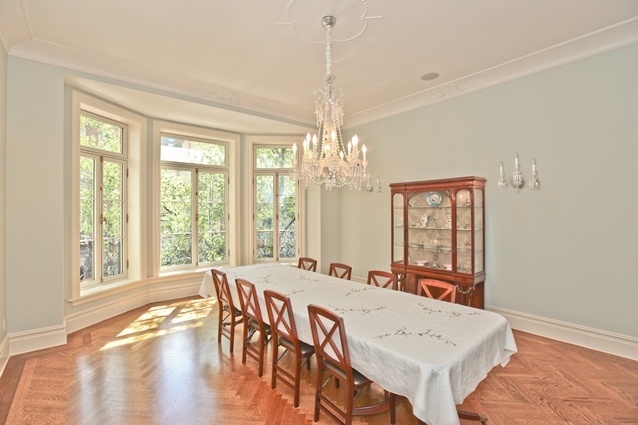 To the right is a formal alcove dining room with a table for 12 beneath a crystal Baccarat chandelier. A discrete butler pantry that includes it’s own sink, dishwasher and cabinet space and a private staircase that leads to the main kitchen on the ground floor, makes this room perfect for entertaining guest. Between both rooms is a concealed powder room. Floors three and four each include two bedrooms with en-suite waterworks baths and walk-in closets designed by California Closets. The entire fifth floor is a dedicated master bedroom. On the south side is a custom designed Waterworks bath with a skylight, his and her sinks, a claw-foot tub, followed by a concealed toilet and baday to the left and a standing shower with ming dot tiles to the right. Between the master-bedroom and the bathroom is a large walk-in closet also designed by California Closets. Facing north is the master bedroom which features a vanity and French doors that open to a balcony with views of the city. Other features include: a roof deck, a built-in outdoor barbecue, zoned temperature controlled air conditioning and heat, radiant heated floors, an elevator that services every level, spot lighting, a security camera, a sensory alarm system, custom designed moldings, surround sound on the first, second and fifth floors and expertly sourced finishes in every room. Located in the Beekman Neighborhood, steps from the United Nations, this impeccably appointed Upper East Side Townhouse for Sale is being offered for $15,000,000.